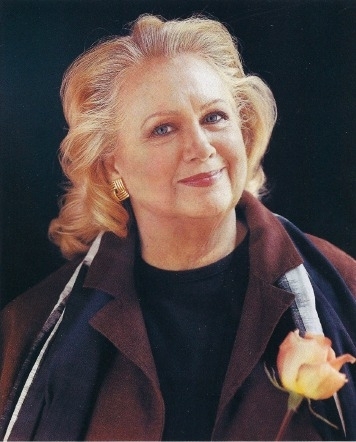 Barbara Cook, star of Broadway and the concert stage, died in New York City on August 8, at the age of 89. The following story was originally published by Town & Country in February 1998. A personal reminiscence follows. Cook has a word of advice: Be yourself. That's where safety lies. wasn't much. She had lied about her age and had done some tap dancing in burlesque back home. She had sung some songs in clubs and summer resorts. What she had never done was play a character. But when she walked out onto that empty stage and sang "My Funny Valentine," who cared? Singing came naturally. "I never didn't sing," notes Cook, the daughter of a traveling salesman and a switchboard operator. "As I got older, I hoped people would pay me for it." They do, they do. Cook is a favorite in London, where a critic for the Financial Times keeps comparing her to classical divas of yesteryear even though she does not sing opera. (Sample quote: "Has any singer since Callas matched Cook's sense of musical architecture? I doubt it.") Last year at this time, after celebrating her 70th birthday with a gala at the Royal Albert Hall, Cook sang an encore for Her Majesty and Prince Philip's golden anniversary party: "People Will Say We're in Love." She has sung in Tbilisi, in Moscow, in Paris and—this was a special thrill—on the stage of La Fenice in Venice, where Verdi had premiered La Traviata. At home in New York, Cook does cabaret acts twice yearly at the Cafe Carlyle, downstairs at the impeccable Carlyle Hotel on Madison Avenue. And on November 9—in what's sure to be a sellout—she returns to Carnegie Hall, the scene of her triumphant concert debut on January 26, 1975. "The enthusiasm and excitement of her audience increased with every song," wrote one eyewitness back then, "and she responded with a pure delight all her own." Anyone who thinks he's exaggerating should check out the live album Barbara Cook at Carnegie Hall (Sony Classical CD). Flash back to 1951, to Flahooley, Cook's first Broadway show, an oddball satire revolving around a sort of laughing Barbie doll and cloak-and-dagger industrial espionage. Top billing went to the soi-disant Inca princess Yma Sumac, who warbled exotically across four octaves, but the romantic lead was the girl from Georgia. Her first song on the original cast album shows exactly what she brought to the mix: Taking evident delight in the way words dance with the music. The man if my dreams is a dream if a man. . . When he looks in my eyes, does he ever see eyes? No, he sees Venus or Mars. The vibrant, golden soprano that jumps right out at you, the diction that is unforced theatrical and dramatic yet clear as a bell, the delight in the way the words dance with the music—this is already vintage Barbara Cook. She didn't readmusic (still doesn't),which didn't stop her from landing the role of Cunegonde in the original cast of Candide (1965), music by Leonard Bernstein. Her bravura number, "Glitter and Be Gay," has bravura number, "Glitter and Be Gay," has since been appropriated by operatically trained coloraturas, few of whom glitter as she did. Mostly on the job, Cook learned to act (marrying her drama teacher along the way, an alliance that didn't last). Then came a long string of Broadway musicals, among them the landmarks The Music Man (a box-office smash in 1957) and She Loves Me (a box-office disappointment in 1963). In the late Sixties, she dropped out for two or three years. "Middlescence," Cook explains. "Did I invent the word? Like adolescence, do you know? But when you're middle-aged." Fortunately, like adolescence, it was just a phase, and Cook soon bounced back for a second career as an entertainer, bringing to the popular song all the finesse of Elisabeth Schwarzkopf singing Mozart, minus the hothouse affectations. But let's declare a moratorium on comparisons with grandes dames from the far side of music's Great Divide, shall we? They are no idols to Cook. "One reason popular music is popular music is that the singing is very close to the way we're used to hearing people speak. Elocution creates a barrier. Opera singers go in for overarticulation, and the result is often that we can't understand them. I don't believe you have to do that. They have pretty notes, but who cares? Joan Sutherland sings 'I dreamt I dwelt in marble halls... ' and all you hear is dibby-dibby-dibby. She does other extraordinary things, but being understood isn't one of them." How would Cook classify herself? "I'm a soprano with a theatrical and dramatic way of approaching songs." If the years have taken away the brassy edge the microphone caught in Flahooley, they have scarcely touched its bloom. The dizzy high E-flats she sang for Bernstein in Candide's "Glitter and Be Gay" are gone, of course, but then, that flight to the stratosphere was a one-time thing anyway. Cook's way with a song, meanwhile, has become ever more personal, ever more free. "I hope it looks utterly spontaneous," Cook remarks, "but it's very planned, do you know?" Tributes to her artistry have come in many forms. Bernstein incorporated her inflections into the permanent score of "Glitter and Be Gay." Like the fast-talking Robert Preston, her censorious Marian the Librarian took home a Tony for The Music Man. I have in my possession a letter from the media-shy Stephen Sondheim, who writes, "Thanks for the invitation to be interviewed, but I really have nothing to say except how much I admire Barbara's work. Feel free to report that I said so. Yours." Others are more expansive. Jerry Bock, the composing half of the team to which the singer devoted a recent Cafe Carlyle program, reports that he and lyricist Sheldon Harnick had always resisted what he calls an "and-then-we-wrote evening." Never mind that such an evening would have riches to draw on from the likes of Fiorello, She Loves Me and Fiddler on the Roof. "We didn't want the songs to be divorced from the book," says Bock. So how did the show come about? "Barbara didn't ask us—she told us. It was a blessing. If we had only thought of it ourselves, that's how we would have wanted our work to be heard. We couldn't have chosen anyone we would rather have it done by." Adds Harnick: "She brings out all that is there. She thinks about everything, takes her time, brings out every thought, every feeling in a very clear, very emotional manner. It's remarkable. You can't teach that." You can try, and Cook has been asked to. She has conducted master classes as far afield as Sydney, Australia. A more frequent venue—and arguably a more surprising venue than any other—is the Juilliard School, Lincoln Center's multidisciplinary academy of the performing arts, best known for churning out latter- day Paganinis. Yet here, in sessions lasting a mere two hours, Cook challenges students from the Drama Division and the Opera Center to drop habits that, young as they are, are already sometimes second nature of a highly disabling sort. She seldom fails to warn budding opera stars against elocution. But mostly, she emphasizes interpretation. Do make big interpretive choices, she tells the students, because so much of what is in yur mind gets lost in the translation. Invest the material with lots of what Cook calls "stuff"—shorthand for private feeling, emotional richness from deep within. You are enough, she keeps saying. Be yourself. Authenticity, above all, is what Cook wants to impart. There are other coaches out there to help students with technique. "When I started out, I thought everybody sang better than I did, looked better than I did, acted better than I did. I felt so unready. But after a while I realized, 'I'm the only me.' Let your spirit out, so when you leave the room, people really know who you arel You are enough. Don't worry about fitting an image. If you're yourself, you can't get it wrong. That's where safety lies." A budding Don Giovanni, the darling of the Opera Center, is standing on the Juilliard stage. Seven hundred pairs of eyes are on him, none of them more clinical than those of Barbara Cook, who stands over to the left staring through oversize glasses, nose wrinkled in concentration, corners of the mouth turned way down. For twenty of the longest minutes of his life, the singer butts his head on a tricky Sondheirn monologue from A Little Night Music, playing a philandering young aristocrat. Is his wife cheating on him? Unthinkable! But the possibility has him in a frenzy. Articulating up a storm, the student is conveying nothing but his careful training and a bottomless embarrassment. Cut through the defenses, Cook counsels. Let your spirit come through. Use your own experience. "I've never had a mistress;' comes the lad's bashful confession, refreshingly honest. "Well," answers Cook, perfuming Actors Studio Method with a whiff of far-off Atlanta, "you must have had a l'il som'in." Whatever he had inside, the audience wasn't going to see much of it that day. With other subjects, Cook's technique gets more impressive results. Kate Jennings Grant, a recent graduate of the Drama Division, counts her afternoon at Cook's master clas sas a turning point in her four years of training. She prepared "Long Ago and Far Away," a wistful song about partings and new beginnings. First time out, she sang it lightly, keeping its ambiguities at a safe distance. In a typical gambit, Cook had her do it over, sitting down this time, not trying to project it, thinking of singing it to one person, or to herself. "When Barbara pulled out the chair, I knew I was done for." Grant laughs her wild laugh. "She makes you slow down and really think about the lyrics and connect them with what is going on in your heart that day. I was going through a huge transition, saying good-bye to classmates... and suddenly that song about all your hopes and dreams meant something totally different. When I sang the song the second time, I tried so hard, then suddenly doubled over in tears." There were no tears that afternoon from Grant's classmate Claire Lautier, who sang Noël Coward. But like Grant, she was able to shed the bland elegance she came in with for something far less predictable and infinitely more poignant. What happened? "Barbara was able to create a completely safe place," Lautier recalls, "a place where you feel safe to be vulnerable and express yourself in a way you wouldn't normally feel comfortable doing in front of such a large group of people. She puts the focus on your own uniqueness, on what you can bring to what you're doing that nobody else can bring." Cook's personal partner in performance and master class is Wally Harper, a pianist and musical director she has been working with since 1974. He never draws attention to himself, but their rapport gives Cook something she has with no one else." Occasionally I work with other people," she says. "I'll do a few songs. But doing a program would be very hard—like trying to wear someone else's shoes or glasses. The songs are worked out on our bodies. It's nothing to do with whether someone else is a good pianist or not. It's just not comfortable." At Harper's urging, Cook even learned "If I Were a Rich Man" for her Carlyle program. People loved it, but she is not about to commit it to CD. "Recording 'If I Were a Rich Man' isn't my idea of heaven.... " On the other hand, she seems to have needed no coaxing to do "This Nearly Was Mine," a song introduced by Ezio Pinza in South Pacific. Though the choice isn't easy, it would probably get a place on my personal Barbara Cook Desert Island Top Ten, along with "Glitter and Be Gay," "My White Knight" (from The Music Man), "The Gentleman Is a Dope" (from Allegro), "Errol Flynn," Irving Berlin's "Change Partners," "When I See an Elephant Fly" (from Dumbo), "Sweet Dreams" and "Bill" (from Showboat). That's nine. Tomorrow, the choice would be completely different. The next day,again. But for dessert, it would always be "Ice Cream," her show-stopper from She Loves Me, added during tryouts the day after it was written. Say, how many songs does Barbara Cook know, anyway? "Oh, my God! To know and to know to perform are two different things. I'm not one of those people who retain songs I sang fifteen years ago. How many songs do I know? I can't even guess. That's a mind bender." Maybe it wasn't the right question. After all, when Barbara Cook sings a song, it's never just a number.